It's officially Spring! Even if the temperatures dip back below freezing, which in our case is anything below 60 degrees fahrenheit, I've decided to say goodbye to all things Winter. Winter clothes (bye), Winter boots (bye), and even Winter foods (see ya!). Warmer temps make me crave lighter fares and frostier beverages. My crockpot oven tends to get a rest, and my grill comes out of hibernation. Our garden becomes more colorful, and our plates often look just as vibrant. Over the weekend our southern spring was in full swing and we took our little dinner party outdoors with one of my favorite spring time meals, Honey Garlic Pork Tenderloin. I love this meal. It is so so yummy. But (and it's a HUGE but) I tend to put it on my back burner when it comes to meal planning because I rarely have the time to make elaborate meals. And this one isn't even that elaborate, but it typically involves mincing garlic cloves. Again, not hard, but takes more time than I have sometimes. 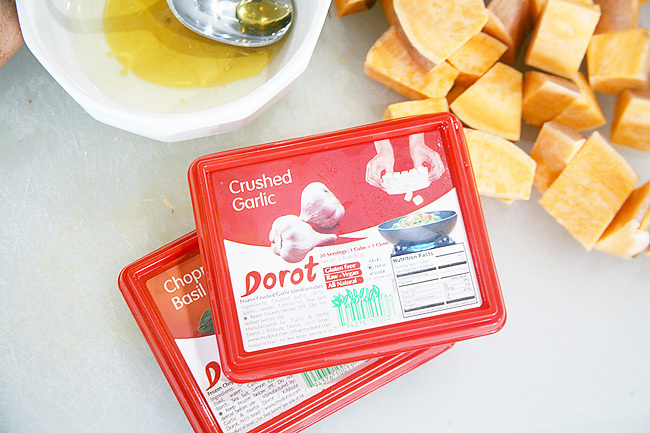 But then as I was shopping along at Trader Joe's last week, I spotted my new favorite meal making time saver - Dorot! After doing a little investigating about these pre-packaged herbs, instantly I realized I would be able to put together delicious meals with out having to take the time to chop/dice/mince my way through a list of herbs - it's already done for me! The Dorot herbs are already prepped and then flash frozen immediately so that they are just as fresh as if I cut them myself. 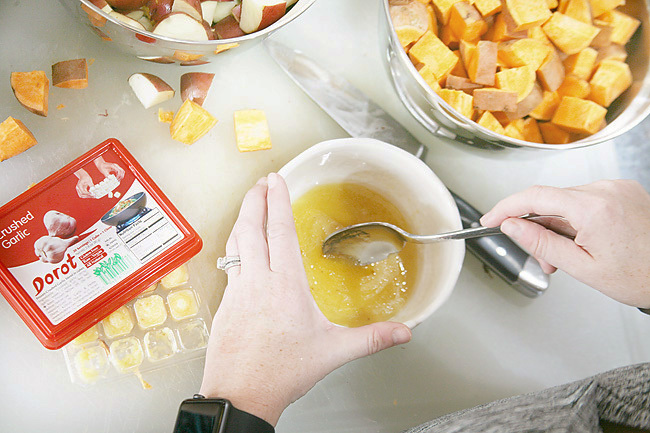 I love that all the work is already done for me and that all I have to do is pop out one of the pre-portioned cubes for my recipe. Half the work, and none of the mess - yes, please! They are completely all natural, Gluten free, Vegan and Kosher, and offer a wide variety of flavors. 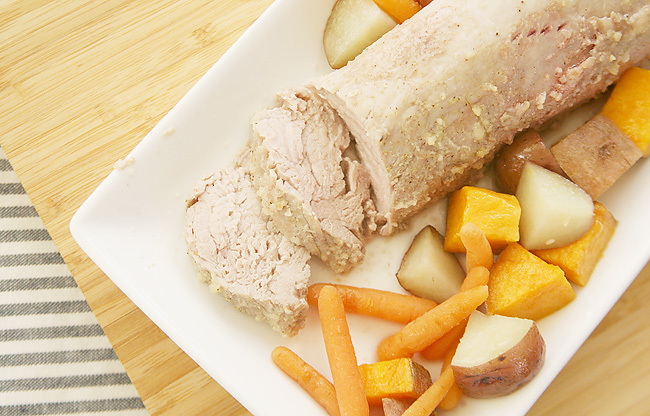 For the Honey Garlic Pork Tenderloin recipe I only needed the Crushed Garlic, but there are six total options - Crushed Garlic, Chopped Parsley, Crushed Ginger, Chopped Basil, Glazed Onions, and Chopped Cilantro. So healthy, easy, and I might not ever have to cry from chopping onions ever again - double yes, please! This recipe was already pretty simple, but now with even less prep time I might decide to tackle it a few more times this spring. 1: Preheat the oven to 375. 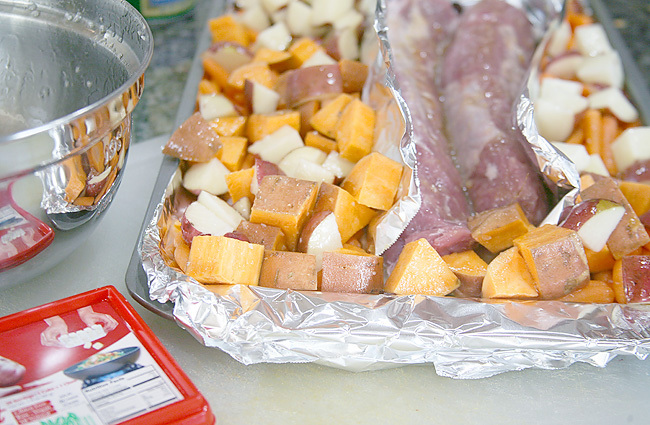 2: Slice the potatoes and put in a large mixing bowl with the carrots. 3: Stir the honey, vegetable oil, and Dorot Crushed Garlic together in a small mixing bowl. 4: Place tin foil on a large pan. Place a second section of tin foil on the center of the pan and then put tenderloin in it. 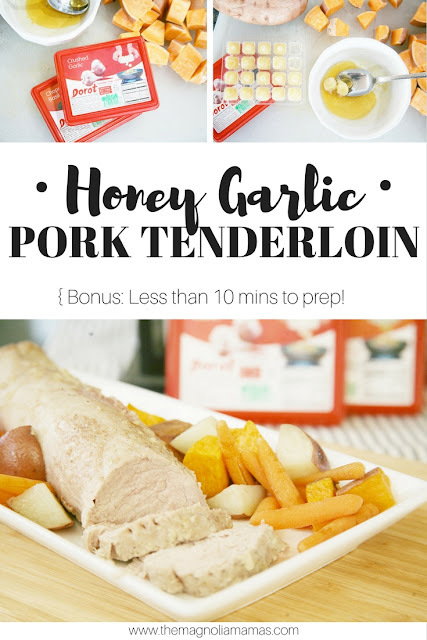 Brush the honey garlic mixture over the tenderloin and then wrap completely with the tin foil. 5: Toss remaining honey garlic mixture over carrots and potatoes. 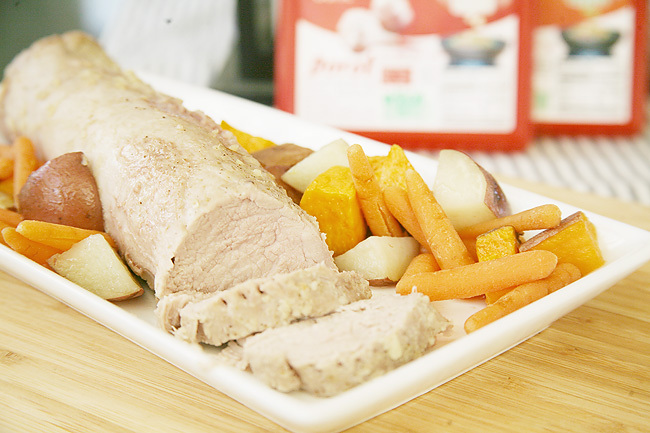 Place carrots and potatoes around the tenderloin on the pan. 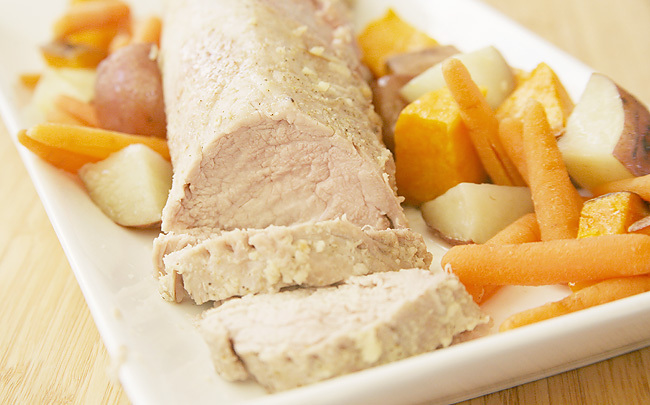 6: Roast in oven for approximately 40-50 mins, or until internal temp reaches 150 degrees. 7: Remove and let tenderloin sit for about 10 mins. See...cheating in a totally good way. A totally good, super yummy way! If you want to cook up a little something elaborate (without all the elaborate work) this Spring, you can find yourself some of these amazing Dorot herbs at Trader Joe's on your next shopping trip. Just look in the frozen section of the store. I was able to find the Dorot products right in the beginning of the vegetable section of the frozen food aisle. 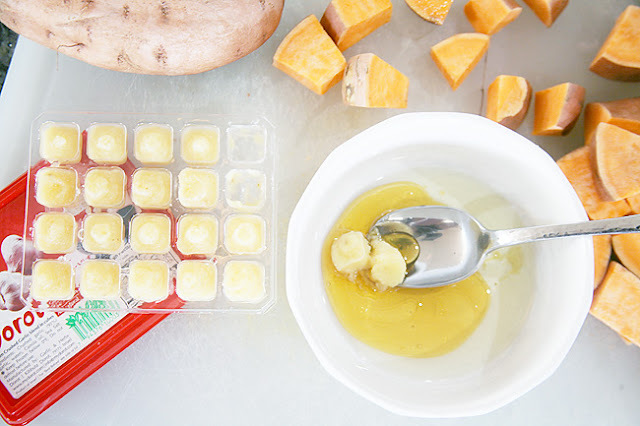 Just pop them in your cart and thank me later when you aren't washing, chopping or peeling! What yummy spring time meal will you be making now that you know less chopping and more enjoying is in your future? Share with us your favorite spring time meals! Yum! 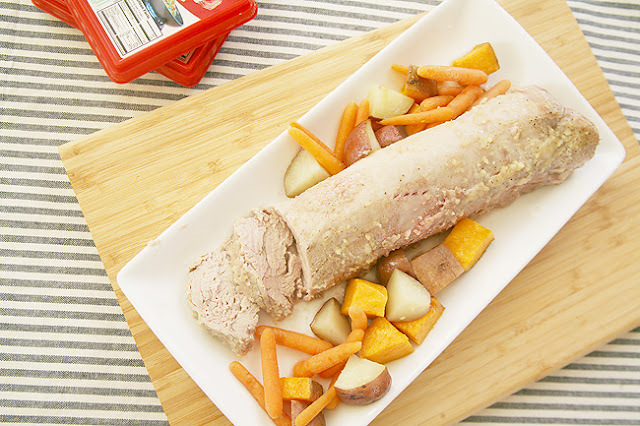 Lovely way to fancy up some pork!